Living a conscious lifestyle doesn't have to be hard, and it doesn't have to mean we compromise what we like for what we think we should like. We launched the Conscious Buys series as a platform to talk about brands that, like FEED, are committed to bringing together a good-for-the-world mandate with great design and functionality, so we can make socially responsible choices in all areas of our lives (a few of our favorites here and here). 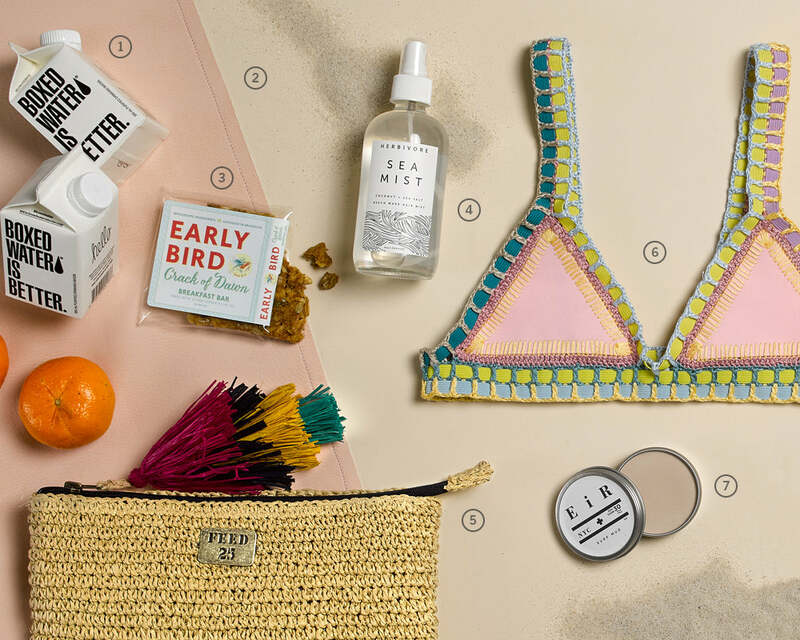 Today, we're sharing our curation of must-have items for a conscious day at the beach. If you're the market for unique warm-weather finds, read on. We all know it’s important to wear sunscreen. What we might not know is the quality of sunscreen we wear. Shouldn’t any substance absorbed by our body’s largest organ, multiple times a day, be free of harmful chemicals? We think yes, which is why we love Surf Mud from EiR. This Brooklyn-made, all-natural, hydrating sunblock for the face (and hair!) contains zinc for UV sun protection, chocolate for deep hydration and increased blood flow to the skin, and antioxidants to fight free radicals. How fun is this spirited bikini top? There’s more to love than the unique design. Turkish-born designer Ipek Irgit sources inspiration for her handmade designs from travels to beautiful beaches around the globe. Just add water (and bottoms). We first heard about Gathre from our friends at Love Taza. After ordering a leather mat for ourselves, we understood the hype. Our Gathre mat is as luxurious as it is waterproof and we love that it’s safe for children (no bad chemicals). The fact that it’s wipeable means you’ll save time, and even more importantly water, in cleanup. Chances are you’ve heard of--or already obsess over--Herbivore. The brand has blown up this year, and rightly so. We love their all-natural take on beauty. This Sea Mist for hair and skin is a must-carry-everywhere item during summer months. Spray the organic, plant-based mist into your hair for easy waves or spritz on your skin for an instant moisturizing refresh. Our guy friends love these board shorts (and this brand) for many reasons. What we love is that they not only look good, but do good. For every pair sold, United by Blue removes one pound of trash from our world’s oceans and waterways. This beaded necklace is the perfect boardwalk accessory. Each one is handmade by female artisans in El Salvador, and provides 25 school meals to children in need. 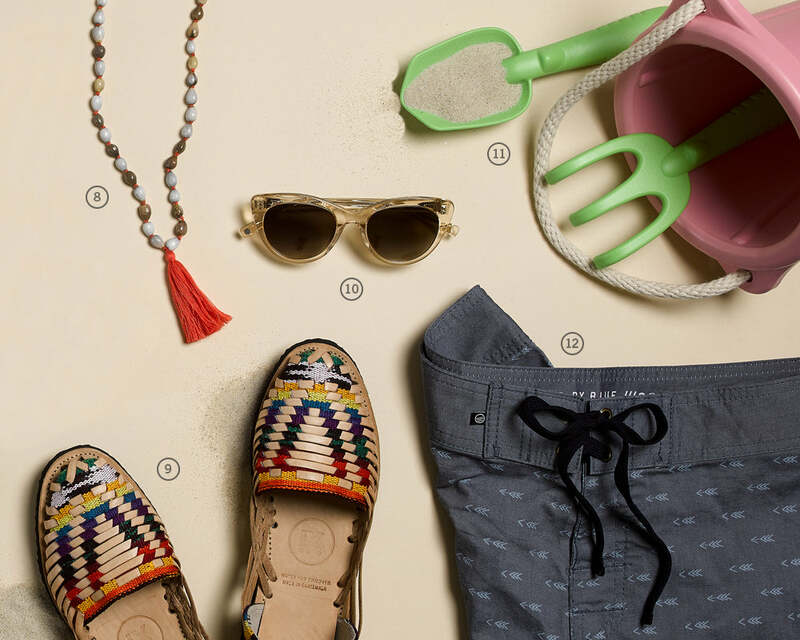 We’re loving the collections coming from our friends at Warby Parker this summer. We initially landed on this specific pair of sunnies simply because we loved the name (Grapefruit Soda), but then fell in love with the unique oversized, slightly throwback shape. You can choose any pair on their site, however, and give sight to a person in need. These woven leather sandals are shaking up our summer footwear game in all the best ways, and we’re loving it. Each pair takes three hours to make by the incredibly talented Guatemalan Mayan artisans who bring them to life. You'll find us in these every day from June through August. These happy beach toys check all the boxes. Made in the US from recycled plastic and packaged in recyclable cardboard, we’re ready to stock up on a few colorful sets for summer beach days.